Finally able to explore more of this preserve. Due to the rains this Summer this part of the preserve was not accessible. This tree was massive with many, many branches. Largo Nature Preserve. Located at 150 Highland SE Avenue in Largo, Florida. Hours: 6:30 a.m. to 1 hours before sunset daily. A 31-acre nature park. Over 130 species of birds, otters, alligators, foxes, rabbits, wild turkeys, and bats. A nature preserve that is like a smorgasbord to the local wildlife! Over 40 interpretive displays to educate visitors on the wildlife in the nature preserve. I was hoping to see an otter or two. No gators to be seen either. Next time! A 5-mile kayak/canoe route begins at the park and ends at Park Boulevard. No dogs are allowed in the nature preserve. I enjoyed being able to walk on the boardwalk that goes all the way around the pond in the nature preserve. The Anhingas were pretty active in swimming about as well as taking flight and landing in another part of the pond. I was startled on one part of the boardwalk when I turned and there was a heron pretty much face-to-face with me – a little too close to nature – the wild need their space! A bitter vegetable. Not a pear, but a fruiting gourd and vine. Smells like an old, well-used gym shoe – Gross! LOOK, but do not TAKE!!! Edible when green and cooked. TOXIC when orange ripe! It then splits into three parts, revealing red arils or fleshy seed covers. Found Connecticut south to Florida to west to Texas. Also Puerto Rico and the Hawaiian Islands. Opened Up & Still TOXIC!!! Wander On! Love to Hear About Your Explorations & Adventures, Please Share! On the Sonoma Coast heading back into Bodega Bay, California. At Goat Rock and Blind Beach on the Sonoma Coast. On exploring the Sonoma Coast I literally had to do a double take on this area! On the first take I could not believe my eyes and was a bit in shock. On the second take I could really see the damage, but could not tell if it was one home or multiple homes. It made me think twice about my dream of building a home on the cliffs of the Pacific Ocean! I published a post on Wesport-Union Landing State Beach Campground (Mendocino County) back on July 13, 2013. The road that runds through the park is crumbling right over the cliffs. It is scary and a little eerie to see two areas like this in one year of traveling around California! There is that fine balance between living, preserving and protecting and Mother Nature trying to take back the naturalness of the land. It is bittersweet in that someone lost their home. Here are photos from the second take. The Mysterious Side to Exploring!!! Santa Rosa, California is the county seat of Sonoma County. The largest city in California’s North Coast, Wine Country and the North Bay (the fifth most populated city in the San Francisco Bay area). In 2013, Santa Rosa was ranked as one the “happiest cities” in the United States! Santa Rosa has a Mediterranean climate with cool, wet winters and warm, mostly dry summers. The area experiences fog from the Pacific Ocean as well as snow in the nearby mountains. Sonoma County is one of California’s largest producers of wine grapes. That is a WHOLE lot of appellations! Where to Start? Santa Rosa is close to the Russian River Valley, so that is the appellation that I explored during my time in Sonoma County. You have to know which wine appellation you are in or you will become overwhelmed pretty quickly in Sonoma County when it comes to wine. The lady at the Vistor’s Bureau stated that Sonoma County is about the size of Rhode Island! Grapes were planted in Sonoma County at Fort Ross as early as 1812. Padre Jose Altimira planted several thousand grape vines at Mission San Francisco Solano in what is not the city of Sonoma, in souther Sonoma County. In the 1920’s there were 256 wineries in Sonoma County, with more than 22,000 acres in production. During the Prohibition period, commercial winemaking declined. At the repeal of Prohibition in 1933, fewer than 50 wineries in Sonoma County survived. In the 1960’s, only 12,000 acres were vineyards. By 1999 Sonoma County had over 49,000 acres of vineyards owned by more than 750 growers and 180 bonded wineries. In 2007, of the 250 wineries over half are less than 20 years old. About 73% of Sonoma County’s agricultural production is growing wine grapes with 60, 302 acres of vineyards with over 1100 growers. The Russian River Valley AVA lies adjacent to and west of the City of Santa Rosa and the southern reach of the Russian River, where the river bends westward and cuts through the Coast Range to the Pacific Ocean. Cooling Coastal Fog + the Petaluma Wind Gap + the Russian River = Great Producing Vines and Grapes! Link to Russian River Valley Winegrowers. Granted AVA status in 1983. Accounts for about one-sixth of the total planted vineyard acreage in Sonoma County. More than 15,000 acres planted to wine grapes. A Celebration of Sonoma County’s finest and best known products! Entrance into the Harvest Fair is FREE. The Harvest Fair is held at the Sonoma County Fairgrounds. The main reason to visit Sonoma County was for the Harvest Fair. The Harvest Fair offers an all-inclusive wine tasting with 150+ wineries ($). This includes craft beer and cider tasting and food pairings. Taste the best of Sonoma County! Link to the Wine Awards for the Harvest Fair. Link to the Craft Beers and Ciders for the Harvest Fair. Link to the Food Awards for the Harvest Fair. Bear Republic Brewing Company is located at 345 Healdsburg Avenue in Healdsburg, California. Tasted: Cuvee de Bubba, a Sour brew. A custom blend of Bear Republic beers that is refermented in oak barrels using only the wild microflora and fauna native to the Alexander Valley. Stone fruits and cherry pie tartness/sourness. Russian River Brewing Company is located at 725 4th Street in Santa Rosa, California. Tasted: Framboise for a Cure (proceeds donated to Breast Cancer Awareness), a Sour brew. Their Blonde Ale aged in Chardonnay barrels (the base beer is Temptation). Then 30 pounds of fresh raspberries are added to each barrel! A great tasting and very drinkable sour brew that is beautiful in the glass with pink to red tones. A nice balance between sweet and fruity to tart and sour. 100% of the proceeds of this brew goes to the Sutter Breast Care Center of Santa Rosa. Good Eats: Had the Mikey Pizza with marinara, mozzarella, sausage, pepperoni, and carmelized onions. Bodega Bay (Sonoma County) is a town that is on the eastern side of Bodega Harbor, an inlet of Bodega Bay on the Pacific Coast. Bodega Bay extends south along the coast to Tomales Bay and north of town is the Sonoma Coast with beaches and more beaches to explore and experience. The Birds in 1963. Hitchcock made Bodega and Bodega Bay appear as one town in the film. The Fog in 1980 directed by John Carpenter and staring Jamie Lee Curtis and Janet Leigh. Sleepwalkers in 1992 based on the original screenplay by Stephen King and directed by Mick Garris. Bodega Bay and its horror movies! Another horror I was not aware of was that a nuclear power plant was planned for Bodega Bay in the 1960s, but was abandoned due to protests as well as the discovery of an earthquake fault. The plant was to be on the site of Bodega Head or aka “The Hole in the Head”. A Beautiful Town that has gone to The Birds! You drive through Bodega (Sonoma County) on the Bodega Highway to Bodega Bay. Do not forget to STOP in Bodega! There is Saint Teresa of Avila Church, the Potter Schoolhouse (now a private residence) and the Bodega Country Store, which has the largest Hitchcock Collection on display. I stopped into the Healdsburg Sonoma County California Visitors Bureau to get more information on Sonoma County. The lady I talked to was a wealth of information on the area. She had me at Bohemian Highway and Bakery! Oh My Goodness, Wild Flour Bread is a must do on the Bohemian Highway in Freestone, California. The dark chocolate and raspberry scone was an AMAZING sweet treat! Their shop has painted birds on just about every wall and there is a painted swarm of sparrows above the wood fired brick oven. I almost felt like I was being watched by these painted birds – CREEPY!!! Do not forget to talk a stroll through their beautiful garden while there. In 1859, shipbuilders constructed Saint Teresa of Avila Church. Saint Teresa of Avila Church appeared in Alfred Hitchcock’s film The Birds. The Potter Schoolhouse (now a private residence) is the actual schoolhouse depicted in The Birds. The Potter Schoolhouse was built in 1873 and constructed from locally harvested ancient redwoods. The schoolhouse was dedicated on October 31st. Driving past the Watson School on the Bodega Highway peaked my curiosity, so I wanted to learn more about the school. The Watson School opened in 1856 and closed in 1967. The Watson School served the communities of Bodega, Valley Ford and Freestone. The Watson School served as a public school for 111 years, longer than any other one room school in California! The Watson School is now a Sonoma County Historic Park. I had a few nightmares after watching this movie years ago and had a few bird moments on this trip! There is just something about their beaks and beady eyes that gives me a pause for thought at times. I enjoy a good Hitchcock movie even if I have to sleep with the lights on, look behind the shower curtain and be wary of birds! I would have loved to get inside that man’s head to see how he worked in coming up with his movie ideas. The Birds is a 1963 suspense and horror film directed by Hitchcock. The movie depicts Bodega Bay, California, which experiences a series of widespread and violent bird attacks over the course of a few days. This whole thing kicks off in a bird shop, really! Mr. Mitch Brenner is shopping for a pair of love birds and the bird shop has none. Melanie Daniels (Ms. Tippi Hedren) meets Mr. Brenner in that bird shop. In a moment of intrigue, Ms. Daniels purchases a pair of lovebirds and brings them to Mr. Brenner in Bodega Bay, California. Ms. Daniels is attacked by a seagull on her way back across the bay from dropping off the lovebirds at Mr. Brenner’s house. Seagulls, sparrows, and crows . . . let the bird attacks begin! Hitchcock was known for his calculated silences in his movies to build suspense and even terror! He wanted to use an electronic soundtrack to create the bird sounds and other noises for the film. Then there were the special effects shots of the attacking birds for the film, which a yellow screen was used in the shots instead of a blue screen! The yellow screen helps the birds movements look more real, especially with all those flapping wings. Interesting Fact: The Birds was honored by the American Film Institute as the seventh greatest thriller. On this day trip we went over the Astoria-Megler Bridge once again and this time made a right instead of a left! We were headed to the Mt. St. Helens Vistor Center at Silver Lake in Castle Rock, Washington. Mt. St. Helens is an active stratovolcano located in Skamania County, Washington in the Pacific Northwest region of the U.S.
Mt. St. Helens is in the Cascade Range and is part of the Cascade Volcanic Arc, a segment of the Pacific Ring of Fire that includes over 160 active volcanoes. The Mt. St. Helens National Volcanic Monument was created to preserve the volcano and allow for its aftermath to be scientifically studied. Mt. St. Helens is a large eruptive cone consisting of lava rock with ash, pumice and other deposits. Mt. St. Helens eruption in 1980 was the deadliest and most econcomically destructive volcanic event in the history of the United States. 57 lives lost. 250 homes destroyed. 47, bridges, 15 miles of railways and 185 miles of highway destroyed. Castle Rock is the gateway to Mt. St. Helens and this city sits at the western base of Mt. St. Helens. Check out the Harry Truman Memorial Park to read about the legendary Spirit Lake Resort owner who refused to abandon his home to Mt. St. Helens. Welcome to Timber Country too! Castle Rock is in Washington timber country. The town was incorpated in 1890 and the local sawmill was the first to produce cedar shingles, using the Western red cedar, which grows in abundance in this region. Made a pit stop in Cathlamet and decided to go back and take the ferry for a fun little side adventure! The Julie Butler Hansen Bridge (now SR409) takes you across the Columbia River’s Cathlamet Channel and into Puget Island. Take the Wahkiakim County Ferry from Puget Island, Washington into Westport, Oregon. Then from Westport you can head back into Astoria. Welcome to the Island! Puget Island is a 7.5 square mile island in the Columbia River. The island was named for Peter Puget, a lieutenant in the Vancouver Expedition of exploration, which first mapped the island in 1792. Pop. 798 persons. This ferry is the last regularly scheduled car ferry to cross the Columbia River between two states. The ferry can hold up to 9 cars and takes about 10 minutes to ride across the Columbia River. The cost per car is $5 and you can also walk or bike onto the ferry to cross too. That Concludes the Washington State Day Trips! It was a foggy morning . . . The Sign Says It All for Today’s Weather! The day trip started in Astoria, Oregon by going over the Astoria-Megler Bridge and into Point Ellice, Washington. I can check Washington State, aka “The Evergreen State”, off my 50 States Checklist! It was so green and evergreens as far as my eyes could see! Mr. Craves became Lewis and I, the CravesAdventurer, played Clark for our day of exploration to the Long Beach Peninsula! 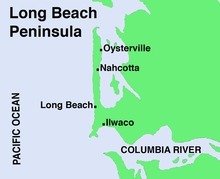 The Long Beach Peninsula has the Pacific Ocean on the west, the Columbia River on the south and Willapa Bay on the east. Leadbetter Point State Park and Willapa National Wildlife Refuge are located at the northern tip of the peninsula. The Long Beach Peninsula is remarkable for its continuous sand beaches on the Pacific Ocean side. Claimed to be the longest beach in the U.S. with 28 miles of sand and the world’s largest drivable beach!. Cape Disappointment State Park, formerly known as Fort Canby State Park is at the southern end. Cape Disappointment is part of the Lewis and Clark National and State Historical Parks west of Ilwaco and was the westernmost terminus for the Lewis and Clark Expedition. Oyster Farming; #1 producer of farmed oysters in the U.S. Interesting Fact About Oysterville: The entire town is on the National Register of Historic Places. Located on the Columbia River and Washington’s oldest salmon hatchery. The Lewis and Clark Interpretive Center features exhibits about the 1803-1806 Lewis and Clark Expedition from St. Louis, Missouri to the Pacific Coast. The Interpretive Center sits on a cliff that overlooks the Columbia River and the Pacific Ocean. There is an admission fee ($). The Cape Disappointment Lighthouse was constructed in 1856 to warn seamen of the treacherous river bar known by then as “The Graveyard of the Pacific”. This is the oldest functioning lighthouse on the West Coast. You Are Here – Almost There! Cape Disappointment Lighthouse – Made It! Leadbetter Point State Park is located on the tip iof the Long Beach Peninsula and driving any further would put you in the bay or the ocean! Leadbetter Point separates Willapa Bay from the Pacific Ocean. Explored the Green Trail or Bay Loop Trail. Even though the tide was out it was still a pretty interesting place to explore. I would love to see the salt marsh when the tide is in. Biologists have recorded over 100 species of birds here, like a bird super highway of migration (Spring and Fall); resting, feeding and nesting. Mr. Craves wondered if this place was used in the filming of the movie The Big Year starring Steve Martin, Jack Black and Owen Wilson. The basis of the movie is a competition among birders to see who can identify the most different species of birds in North America in a calendar year. I checked and the principal photography took place in Vancouver, Canada. Decided to stop at Long Beach for lunch before heading back to Astoria. Checked out the Long Beach Boardwalk and strolled through the downtown area. 1 Day Trip to Washington Down and 1 to Go! Next Day Trip will be to The Volcanoes Area and Mt. St. Helens! Astoria was the setting for multiple movies; The Goonies (1985), Kindergarten Cop (1990), Free Willey (1993), Free Willy 2: The Adventure Home (1995), and Into the Wild (2007) to name a few. The Astoria-Megler Bridge spans the Columbia River and links the Oregon and Washington sections of the Pacific Coast Highway (U.S. 101). The bridge is the longest continuous three-span through-truss bridge in the world. Amazing Feat of Engineering! I cannot imagine being a settler in Astoria trying to travel across the mouth of the Columbia River by canoe! No Thank You! The 1st commercial ferry service did not arrive until 1921. Then construction began in 1962 of the Astoria-Megler Bridge. 1,356 days after construction began, the bridge was ready for its dedication on August 27, 1966. 1st year – 206, 216 vehicles crossed the bridge. By 1993, more than 1.6 millions vehicles a year were crossing the bridge and the toll was removed on December 24, 1993. The Astoria Column is a tower overlooking the mouth of the Columbia River on Coxcomb Hill. The Astoria Column was built in 1926 and was added to the National Register of Historic Places in 1974. The 125-foot column has a 164-step spiral staircase that leads to an observation deck at the top. The tower was built in 1926 with financing by the Great Northern Railway and Vincent Astor, the great-grandson of John Jacob Astor, in commemoration of the city’s role in the family’s business history. The first Community Antenna Television (CATV) System in the U.S. was built in 1949 utilizing the column. The spiral sgrafitto frieze on the exterior of the structure was painted by Electus D. Litchfield and Attilio Pusterla, the mural shows 14 significant events in the early history of Oregon with a focus on Astoria’s role including Captain Gray’s discovery of the Columbia River in 1792 and the Lewis and Clark Expedition. At the top of the column is a replica of the State Seal of Oregon. Fort George is hip and happening, has a great vibe and great brews and the staff is friendly and knows the brews! Fort George Working Girl Porter; brewed with the addition of over 5 lbs of Working Girl coffee beans and chocolate – needed a major chocolate sweet treat to have with this porter. Mr. Craves had the Vortex IPA and I had the Working Girl Porter. Earlier at lunch in Long Beach, Washington we both had the Cavatica Stout and wanted to check out the brewery in Astoria, Oregon. Took a 4-pack of cans to go too; (1) Quick Wit, (1) Vortex IPA and (2) of the Cavatica Stout. Fort George’s Vortex IPA came about during the cross-country truck trip the brewery made to find its home in Astoria it was nearly scattered to the cornfields of Nebraska by a tornado! So Excited to Attend OBF in Portland for the Very 1st Time!!! Your Brew is Served in a Mason Jar – Jelly Jars are offered too! Stopped by Wet Dog Cafe and Astoria Brewing Company for a Brew and Sweet Treat! Both of us had the Poop Deck Porter (name still makes me chuckle) and shared a (made fresh) Marionberry Cobbler with Oregon marionberries (have to try one or more of these berries – YUM!) and vanilla ice cream. The porter was dark and had notes of chocolate with a little something, something in the finish. If not in public, probably would have licked the cobbler dish clean. Stopped in to check it out and pick up a t-shirt for a buddy. One BIG Can of Shrimp! Love that the Artist included the Egg! That Concludes the Oregon Coast Tour! The City of Tillamook is located on the southeast end of the Tillamook Bay on the Pacific Ocean. The Tillamook area has fiver rivers, the Tillamook, the Trask, the Wilson, the Kilchis, and the Miami. Welcome to Dairy Farm Country! The farmland used for dairy cattle supply the Tillamook County Creamery Association’s production of cheese, particularly cheddar, ice cream and yogurt. The Tillamook Cheese Factory is the Tillamook County Creamery Association’s original cheese production facility. Tours are self-guided. You cannot tour inside the actual cheese processing area, but can see the cheesemaking process and cheese packing process from the viewing gallery over the main production floor. I enjoyed watching the various processes going on. The Tillamook Cheese Factory hosts over 1 million tourists each year. Cannon Beach is best known by its famous landmark, Haystack Rock! Cannon Beach is pretty compact and pedestrian friendly. Famous Movies Filmed in Cannon Beach and Ecola State Park; The Goonies (1985), Point Break (1991) and Twilight (2008). Haystack Rock is located southwest of downtown Cannon Beach near Tolovana Park. Haystack Rock is 235 feet in elevation and often accessible at low tide. Near Haystack Rock are the Needles, two tall rocks rising straight out of the water. Haystack Rock is protected as a marine sanctuary as part of the Oregon Islands National Wildlife Refuge. Seaside is a Great Jumping Off Point to see the Oregon Coast! Seaside lies on the edge of the Pacific Ocean. The Necanicum River bisects the city and flows out to the ocean at the city’s northern edge. Tillamook Head towers over the south edge of the city. In 1806, a group of men from the Lewis and Clark Expedition built a salt-making cairn to make salt from the Pacific Ocean to replenish their supply. In 1912, Alexandre Gilbert was elected Mayor of Seaside. Gilbert donated land to the City of Seaside for its one and a half mile long Promenade along the Pacific beach. Stay Tuned . . . The Oregon Coast Tour Continues in Astoria, Oregon!